The 1994 Rwandan genocide represents one of the most tragic episodes of political violence in recent history. Estimates suggest that in just 100 days, conflict between the Hutu majority and Tutsi minority resulted in the killing of between 500,000 and 1 million citizens. In response to the genocide, the United Nations created a criminal tribunal for Rwanda, and 77,000 people have been prosecuted for being members or accomplices of armed militias that carried out attacks and 433,000 for engaging in localized violence. A 2014 paper published in the Quarterly Journal of Economics, “Propaganda and Conflict: Evidence from the Rwandan Genocide,” looks at the impact of Radio Télévision Libre des Mille Collines (RTLM), a key media outlet for the Hutu-led government, on violence and killings of the Tutsi minority. The study, by David Yanagizawa-Drott from the Harvard Kennedy School, analyzes how exposure to propaganda and inflammatory messages calling for the extermination of the Tutsis fueled violence by the Hutu population. Using a village-level dataset, the author tests two hypotheses: The first examines the direct effect of exposure to RTLM broadcasts on violence levels in those villages, mainly through persuasion. The second analyzes the social interactions and spillover effects from RTLM listeners to non-listeners in nearby villages, through social interactions. Both militia-led violence and localized, individual violence were analyzed. The paper represents a departure from previous qualitative studies, as it uses geographical tools (ArcGIS) to establish the difference in the levels of violence between a group of individuals that was within the reach of RTLM broadcasts and a control group that, because of the geographical features of Rwanda, was outside the station’s transmission area. 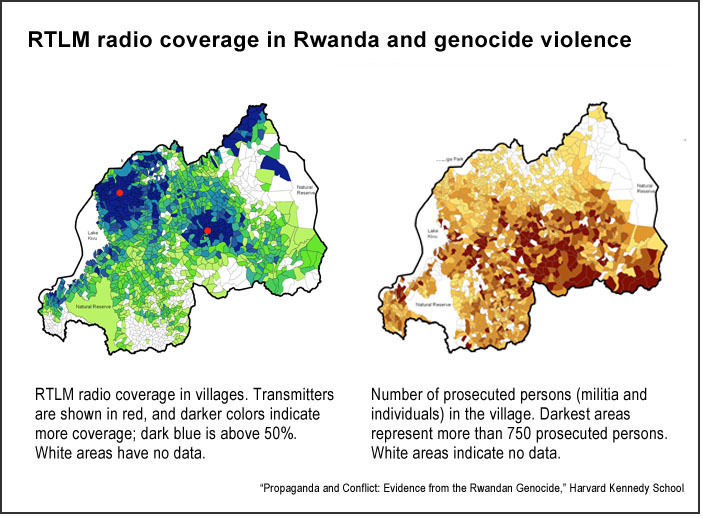 Approximately 51,000 perpetrators (10% of overall participation in the Rwandan genocide) can be attributed to the station’s broadcasts, and almost one-third of the violence by militias and other armed groups. Full exposure to RTLM broadcasts increased the number of persons prosecuted for any type of violence (militia violence or individual violence) up to 69%. On average, a one standard deviation increase in radio coverage increased total violence participation as much as 13%. The estimated effects of RTLM reception were statistically significant at the 5% level. For low-level increases in radio coverage, there seems to have been no rise in the population’s participation in violence. However, when a critical threshold of coverage is reached, there is a significant rise in violence. A list of transcripts from all broadcasts by RTLM between July 1993 and July 1994 are available on the Rwanda File website. A 2013 paper published in the Annual Review of Law and Social Science, “The Justice Cascade: The Origins and Effectiveness of Prosecutions of Human Rights Violations,” present a cross-national view of trends in human rights prosecutions. The authors trace the origins of individual criminal accountability, the process by which this new norm has spread globally, and its impact on repression levels in those countries and regions where prosecutions have taken place. Citation: Yanagizawa-Drott, David. “Propaganda and Conflict: Evidence From the Rwandan Genocide,” Quarterly Journal of Economics, August 2014. doi: 10.1093/qje/qju020.